Judges at Pattaya Hard Rock Hotel’s were looking for beauty and a deep understanding of music history and style when they chose the hotel’s “Miss Hard Rock 2011” at the beachfront hotel last month. Different from most beauty pageants, the May 28-29 Miss Hard Rock contest valued rocker-style clothing over swimsuits and talent in identifying song titles and performers over singing and dancing. 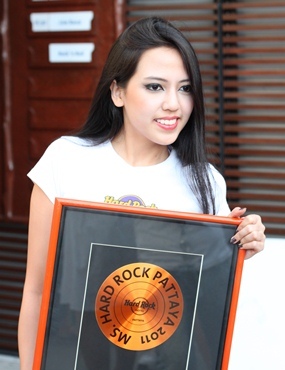 Piyada “Jamie” Monmaneerat was crowned as “Miss Hardrock Pattaya 2011”. Thirteen women vied for the title in a bid to become the hotel’s public relations ambassador for the next year, and after two days of competing 22 year old Piyada “Jamie” Monmaneerat from Bangkok was delighted to take the winner’s sash and the 142,000 baht first prize. Piyada certainly seemed to make an impact with the judges with her fine rendition of the Alicia Keys number “If I ain’t got you” during the talent contest round and she will now go on to represent Hard Rock Pattaya in all the hotel’s rockin’ events and promotions during the next 12 months. Penlak “Honiez” Kanchanawadee took first runner up prize, followed by Kirataya Phosarn as second runner up and also winner of the “Miss Rock Facebook” award, voted for by the general public online. In addition there was a separate prize titled “Miss Rock Friendly Breeze”, which was awarded to the girl chosen by her fellow competitors and the media; in this case the winner being Chanya Wichianlam. All the winners will take part in a future fashion shoot to be featured in the exclusive Rokz Magazine. Piyada “Jamie” Monmaneerat introduces herself to the judges on the first day of the contest. The contest followed few of the rules of traditional pageants with the first day having contestants quizzed by judges on their musical knowledge. They also gave background on their favorite performing artists and had to name the title and artist of various song clips. They also put on a fashion show of rock-styled clothing around the pool. 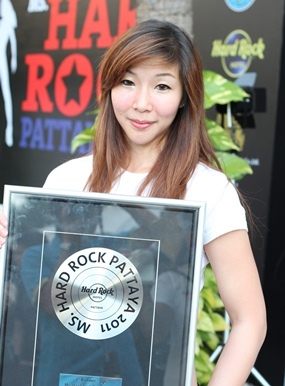 The day wrapped with a chance for hopefuls to talk about the Hard Rock Pattaya in public. The second day saw contestants get back into a more-traditional mode, slipping into swimsuits for the judges’ approval. They also worked more on showing off their spokeswomanly skills. Penlak “Honiez” Kanchanawadee took the 1st runner-up prize. Chanya Wichianlam was “Miss Rock Friendly Breeze”, voted for by her fellow contestants. 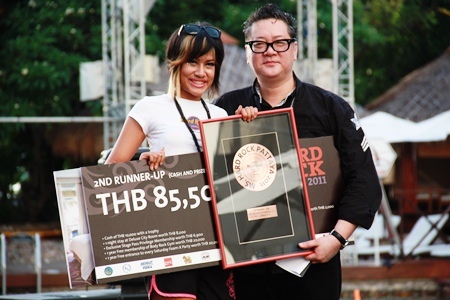 Kirataya Phosarn, left, 2nd runner-up and “Miss Rock Facebook” receives her awards from Jorge Carlos Smith, General Manager of Hard Rock Hotel Pattaya. The girls talk time out from the competition to relax at the Hardrock’s foam party. The contestants strut their stuff on stage. Swimwear was the order of the day for the final round of judging.